Split the payment over 13 weekly payments of $59.15 Shipping & returns info Free shipping! 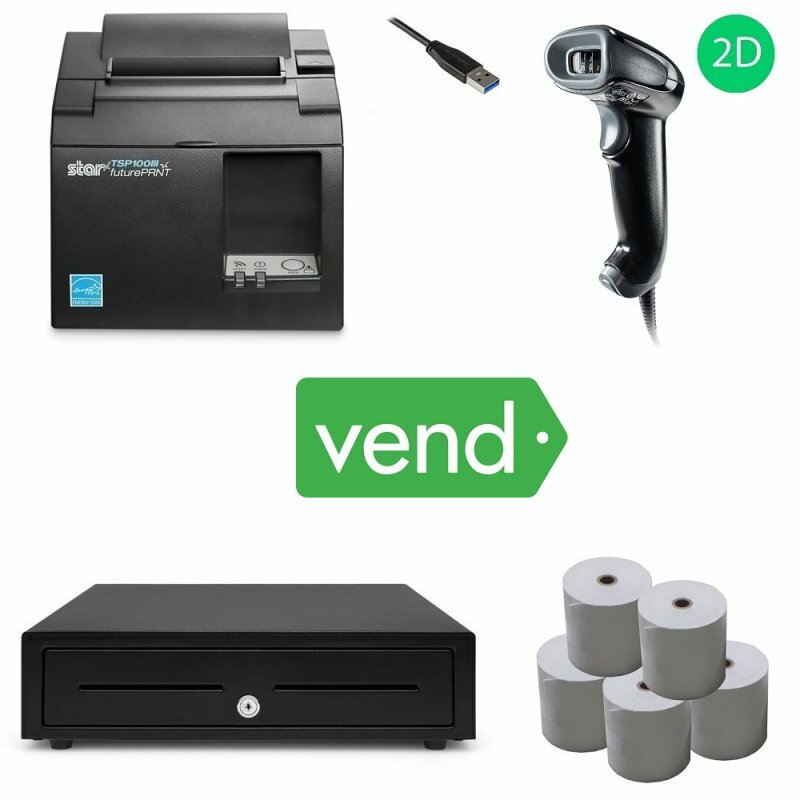 This Vend Bundle is compatible with PC & MAC and allows you to provide your customers with Free Promotional Material and Digital Receipts using AllReceipts by Star Micronics. 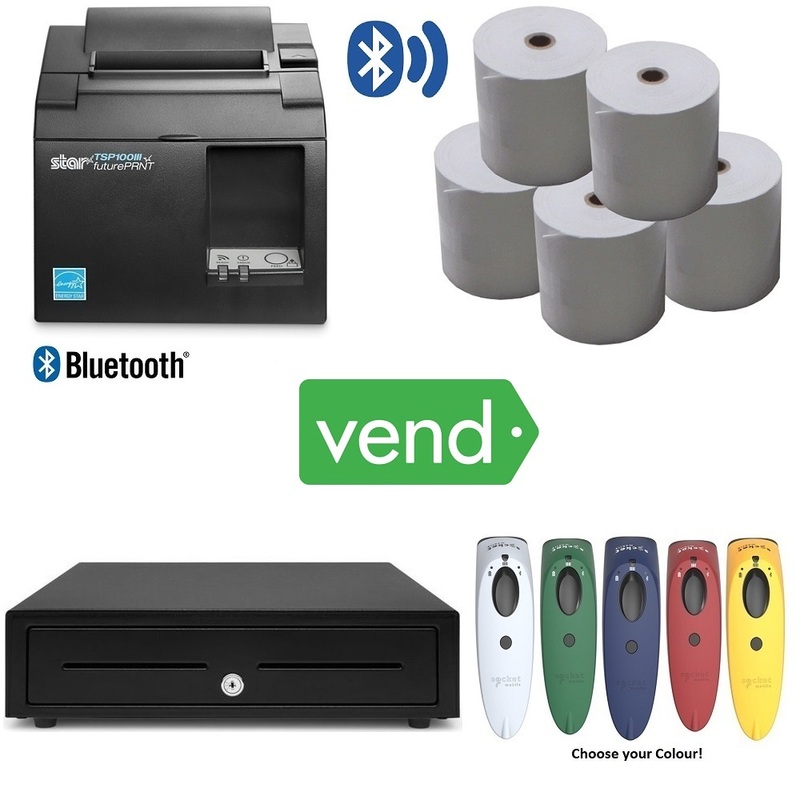 Promote your business and get customers back in-store by providing coupons that can be generated using the AllReceipts Digital Printing service provided by the Star TSP100III Series of receipt printers. This bundle is compatible with both PC & Mac. Check out the below details for individual product specification. Star revolutionises POS terminal Device Choice with DIRECT iPad Receipt Printing via standard iPad /iPhone / iPod USB - lightning cable. The Star TSP143IIIU POS Printer changes all this. Designed to work with today's market leading operating systems - Android, iOS, Linux, Mac OS & Windows, this printer will have a dramatic impact on the retail environment. The Honeywell Voyager 1450G Barcode Scanner allows enterprises to embrace area-imaging at their own pace, and in the most cost-effective manner. Built on the platform of Honeywell's world-renowned Voyager series of handheld scanners, the Voyager 1450g delivers omni-directional reading of linear bar codes, plus the ability to affordably upgrade the device to enable PDF and 2D bar code scanning either at the time of purchase, or as data capture needs evolve. Offers omnidirectional reading of virtually all linear bar codes and the most widely used 2D bar codes, including poor quality and mobile bar codes (2D decoding available in select models). Unlike traditional laser scanners, the 1D version of Voyager 1450g can read bar codes omni-directionally, making it ideal for presentation scanning. Scans coupons, mobile tickets and digital wallets from the screens of mobile devices. For those who only require 1D scanning now but anticipate the need for 2D scanning in the future, the Voyager 1450g can be affordably upgraded from 1D to 2D scanning at any time. Meets diverse scanning requirements by offering models with basic functionality, with software licenses enabling additional functionality as needs evolve. Reduces total cost of ownership by providing a turnkey remote device management solution that easily manages and tracks usage of installed devices.